Tindaloo in CyberSpace: ..it was a dark and Spooky night..
Råstilig monster stempel motiv, ikke sant? Akkurat i tide for Halloween! Men egentlig funker det vel året rundt, iallefall til en fantasy/scifi/horror fan som meg selv ~ the Walking Dead, Supernatural, Game of thrones, the Vampire Diaries, American Horror Story ++ er kjempefan av disse og mange flere. Og SSD er en av de få som har mange tøffe motiver i monster sjangeren! Jeg er gjeste-designer denne måneden også for Sassy Studio Designs, og dette er mitt GDT bidrag til SSD's Oktober Progressive Utfordring, som foregår på facebook gruppa deres. .. som jeg nesten glemte av! Fant det ut helt i siste liten *puh*! ..Og så må du ikke overse den kjempeflotte Bloggcandy'en..
..som jeg har akkurat nå (tom. 25 november!) Alle er vinnere!!! :).. Isn't this a gorgeous spooky babe? She's a cross between all the coolest monsters, ghost, zombie, frankensteins bride and a bit mummy.. a real ghoul! Had such fun coloring her up, then forgot all about it as my migraines kicked in, and tonight I got a flashback that I had something to deliver ~ to the Progressive challenge at SSD's FB group for October. If you parttake in the ch. for the first time, you get the digistamp for free, otherwise you can buy in if you missed a month. The progressive part is you using that image and you get the next months image for free as long as you keep playing :) Stop by for the next one in November! Rules are listed here. ● The Pencil Case Wk5. ~ Eerie colours [Nov. 7th.] I made TOP 3! ..& Did you see my yummy Blogcandy!?.. 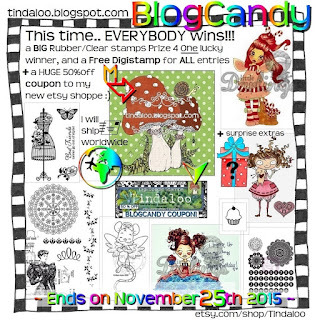 ..Everybody is a winner :)..
Stamps/Images: Sassy Studio Design digistamp 'Buttercream Babe - Halloween'. Lazar StudioWERX Inc rubberstamp 'Funky Holidays' (swirl). Kort & Godt 'M-143'. Inkadinkado mini clear stamps 'Spooky ghosts', and 'Haunted house'. Purple Onion Designs Stamps 'Vintage Damask Background'. Papers: Bazzill cardstock. Plain white cardstock. Digital kits: Tickled Pink Studio 'Only You minikit'. (journaling frame). Createwings Designs 'October Night' elements (bats). I have made (in Photofiltre) the spooky scene inside the card with misc. digi elements and masks. : Studio Blagovesta 'Something Wicked This Way Comes Bundle'. Sweet Caroline Studio by Celeste Knight 'Fright papers - Halloween'. Gallery Yopriceville Free Clipart 'Halloween Tree and Skeleton Clipart Image'. Embellishments/Tools: EK Success® 'Inverted Corner Punch'. Marvy Uchida punch 'corner rounder small1'. Tigerstore TGR lilla washi. The damask background is just sooo much more fab 'in real life', with a mica powder shine and made with clear embossing powder (all from Ranger) and Tim's DI 'Hickory Smoke', 'Black Soot', 'Stormy sky', 'Faded Jeans' & 'Broken China'. Check out a tutorial on this technique by one of my crafty gurus, Jennifer McGuire on youtube here: Easy Distress Ink Watercolor Backgrounds. (I didn't iron it off though, and yes ~ Tim is still my crafty guru number one, but Jennifer is a close second.. together with Dyan Reveley ofcourse.. aaand a couple others! *lol*). Thanks for sharing with Left of Center --- Fab Halloween card - spooky image! Such a fun a spooky card. I love the inked panel. Thank you so much for playing along with us over at the Simon Says Stamp Monday Challenge Blog this week!